This may not be news, but today is the last day of 2010. As we all hustle and bustle through today in anticipation of the great parties and questionable decisions of tonight, and we all make our resolutions; looking always forward, we have to remember to look back too. Since New Year's is always about the perpetual forward motion of existence, albeit arbitrarily concocted via our perception and construction of time, we often forget how much the last year meant to us, and the year before that, and all the way back to ten, 20 years ago. And we do this with music, too, as our hunger for the new and original (imagine air quotes around that last one) often overrides our interest in seeking older sounds. See, that was a great segue, right? So, today, let's look back, not to last year, not to 2009 or 2008 or even 2000, but back to 1991, when several people who can definitely drive and can very nearly (legally) drink, were born. 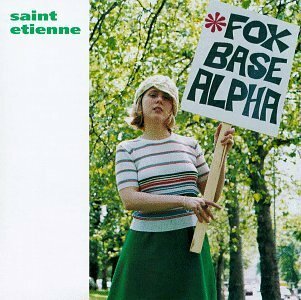 That was the year Saint Etienne released Foxbase Alpha. Pitchfork posted a great review of the album's reissue back in '09, an album that expanded to two discs to capture all the material that we never knew we needed to know. For me, I got a copy of the original issue, down at our local Twist & Shout, and even now the dance-laden, poppy and aware music falls out of my iTunes into the air around me. The original album is eclectic and energizing, mixing in the kind of chill pop music any Saint Etienne fan expects, with occasional radio-fuzz between-tracks and a fine blend of electric piano, guitar, horns and strings. In fact, without the year stamped on the back of the album, it's highly unlikely that this music, heard as a new experience, could be placed temporally as a turn of the Go-go '90s at all. On later albums, Saint Etienne shows a greater capacity for morose, self-aware dance pop, but with Foxbase Alpha, their debut, they are free and loose and every song sounds full of promise and excited by possibility. Especially during a time when dance music like theirs would have struggled to compete with the death throes of glam metal, and the rise of grunge and hip hop. So, you get tracks like the (I'll back track slightly on my previous claim of timelessness) very '90s-esque "Only Love Can Break Your Heart" (Seriously, do you hear the Ace of Base-y-ness in that opening riff?) and the stellar whispering/singing "Nothing Can Stop Us." These are songs about optimism and youth and vibrant energy, even in heartbreak, rather than the deeply self-important, emo-fuckery of other popular genres from the same time period. So, with this album, a fun 9/10 of an hour, you gain a lot in the way of freely looking forward, while keeping a guard on your past. And it's worth checking out, even if you feel that the old music, that is not yet classic, or canon, is not. Remember the past. Here in Colorado, we're just over 12 hours away from next year. 2010 has been a truly life-changing year. Paths are new, machetes brought out to clear the brush, and new has combined with old in the most phenomenal way I could think of. So, from the bottom of my heart, as we wave goodbye to one number on the calendar, and write in another, I wish everyone a happy 2011, and a year filled with peace, happiness, love, and dreaming. And a year in which we all look back to what we were once, remember it, learn from it, and keep the parts of everything about us that are great, no matter how much we've grown. Deepest love and best wishes to everyone from the folk (It's just me) at Gas Lantern Media.